All transactions are safe and secure with a reliable history in online purchasing behind each of our associates. 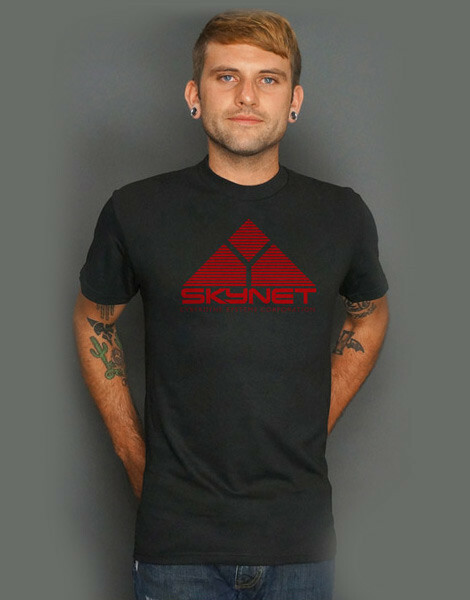 Buy the Skynet t-shirt to own Terminator clothing and merchandise. Skynet is a computer system that was developed by Cyberdyne Systems for the military. The artificial intelligence was created to help remove human error issues in combat. After deciding the system was too powerful, they tried to dismantle it. This resulted in Skynet determining that humans were their enemy and must be destroyed. If you enjoyed watching the war against technology, then snag this Skynet t-shirt today. Also check out the rest of the Terminator clothing like the Cyberdyne t-shirt and others. In addition to the Skynet tee above, browse the Terminator Clothing Gallery for more apparel like men's and women's clothes, kids shirts or hoodies.